I hadn’t realised until quite recently that George Pal originally wanted the last third of the film in 3D but this was abandoned probably due to cost. It would have been great in 3D though and of course it’s release coincided with a great many 3D films being around. Directing the film was Byron Haskin – great film director !! Gene Barry was really good in the leading role here – many of us will remember him from the later TV series we had from the USA ‘Burkes Law’ which was very popular here in the UK - in fact apart from Burkes Law and The War of the Worlds I can’t think of any other picture he was in off the top of my head. A lobby card showing the final minutes of the film where sheltered in a church they prepare for the end – not knowing that the smallest living beings on this earth would save them and the world. Even by todays standards this is classic, and an almost perfect masterpiece. Brilliant design work on the alien ships, incredible sound effects, and sharp, vivid colours are in evidence here. Director Byron Haskin’s pacing of the film is tight and he draws out a masterful performance from Gene Barry as a scientist in awe of the alien’s capabilities. The realism of the story telling is unrivalled in most modern science fiction films. 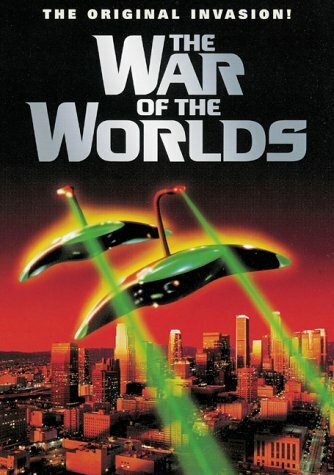 Maybe it’s not true to H.G.Wells’ original story but so what – this is a great film..
Gene Barry was born Eugene Klass on June 14 1919 in New York City. A radio contract led to a prewar stint as a vocalist with Teddy Powell’s band during which he was spotted by the producer Max Reinhardt, who cast him as The Bat in the Broadway show Rosalinda. Two years later he went into The Merry Widow. In 1944 Barry found himself unemployed but in 1951 his luck changed when Paramount offered him a film contract. This was followed by Soldier of Fortune (1955), with Clark Gable, and in 1957 he was twice used by Samuel Fuller, in China Gate and Forty Guns. Gene Barry made TWO films in the 1960s – Maroc 7 in 1967 and Subterfuge with Joan Collins two years later – but they were judged to be dire. He was however nominated for a Tony award for his portrayal of Georges in the 1983 Broadway production of La Cage aux Folles, the magnificent farce about a homosexual couple in St Tropez. When not acting, Barry performed a cabaret turn in which he sang, danced and told jokes. He was frequently seen on British television in ITV’s Sunday Night at the London Palladium and starred at The Talk of the Town in the 1960s and 1970s. Gene Barry travelled everywhere in a Rolls-Royce Silver Cloud and dressed to suit this image. His home was a colonial-style Hollywood mansion complete with enormous swimming pool. Gene Barry died on December 9th 2009 at the age of 90 of congestive heart failure at Sunrise Assisted Living in Woodland Hills, California but had lived at his home in Beverly Hills until about a year before. He is remembered today for directing 1953′s The War of the Worlds one of many films where he teamed with producer George Pal. In his early career he was a special effects artist for which he earned Three Oscar nominations but later in the1940s he turned to directing and came to England to make Treasure Island for Walt Disney at Denham Film Studios – He did a superb job on it too. Another he directed was The Naked Jungle with Charlton Heston and with him at the climax of the film were millions of ants. She played the female lead in this film BUT I have to say that I don’t know anything much about her. However here are some snippets I have discovered. Ann Robinson grew up close to the Hollywood film studios, acted in a few school plays and then later fibbed her way into the movie business as a stunt woman. She became part of Paramount’s golden circle of new stars in the early 1950s but War of the Worlds was her only starring role up to that time. In 1957, she ran off to Mexico to marry a famous matador Jaime Bravo (“and blew my career right out of the water”). They had two sons. Since 1987 Ann Robinson has been married to real estate broker Joseph Valdez. She is a fixture at sci-fi conventions and autograph shows mainly on the back of this film.